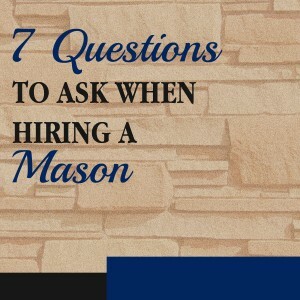 Hiring a Mason – like hiring anyone – requires doing some homework and research on your part. But where do you start and more particularly – what do you ask them? According the Mason Contractors Association of America (MCAA), Masons should be trained to work with a wide range of materials – from natural rock to clay & concrete brick. However, not all Masons are created equal, so it’s important to make sure you ask the right questions for the job. In today’s post, we’ll share some basic, general questions you should ask a Mason before giving them the green light to start your project. Let’s jump right in! People take this for granted. Not all masons have extensive experience and not all masons do things by the book. Making sure they’re certified by all the appropriate bodies – from the MCAA to having their local general contracting licenses is important. If they cut corners there, chances are that they’ll cut corners on your project. Also ask for proof of insurance. It’s one thing to say they have it, it’s another thing for it to be current. Do you have experience with the kinds of materials I’d like to use? All Masons have specialties and all Masons have areas of weaknesses. Some might be great at working with natural stone, others might not be. Make sure you do your homework and ask them what kinds of materials they work best with and which ones they don’t. Chances are you could be talking to a great Mason who might not be a good fit for your project. It happens a lot. Always be sure to try and check references. Not only will it give you’re the reassurance that they can do they job they say they can do, but you can also get a sense for how they work and what it’s like to work with them. Just like with any kind of contractor in any industry, you’re hiring more than just a person to do a job. This helps you get a feel for them from a 360-degree perspective. Cost is obviously a huge hurdle to clear, but also be sure you know what the payment schedule looks like. Masons may need to buy materials up front to complete the project, so don’t be surprised if they ask for as much as half of the total cost up front. How the rest of the bill is paid from there, should be clearly laid out before hand. Is there anything I should prepare before you start working? Not all Masons will want you to do this, but it’s a great question to ask. If there is basic prep work you can help with before hand, it might save you a little money in labor. From the Mason’s standpoint, it’s one less thing they have to do. So go ahead and ask. Some Masons may say ‘don’t worry about it, we’ve got it covered’ and that will be that. Others may appreciate the gesture. What kind of cleanup will happen after the project? This is always a major bone of contention whenever you’re dealing with a contractor and often leads to needless dispute. If you want the jobsite cleaned up once the project is complete, then explicitly say so in the contract. All too often people don’t add this into their agreement and they get left with what they paid for – but also a huge mess they have to clean up. Put clean up and site break down in writing so that when your project is finished, you can enjoy their work and not be chasing them down for the things you thought they were supposed to do! Who will secure the materials? There is a good chance that if you’re smart about it – you can procure materials at a lower rate than a Mason. Hear what they have to say and take their advice into strong consideration – they’re the professionals, after all. But also don’t be afraid to see if you can buy the materials on your own. It could drive a significant portion of the cost down. Just make sure they’re comfortable working with the materials you’d purchase and if they bring up potential issues with the products you’re looking at – be sure to listen! While it IS good to cut costs here and there, don’t forget the old saying: You get what you pay for!